In the days before the Civil War, there lived a Louisiana people unique in Southern history. Though descended from African slaves, they were also descended from the French and Spanish who enslaved them. Called the Free People of Color, this dazzling historical novel chronicles the lives of four of them - men and women caught perilously between the worlds of master and slave, privilege and oppression, passion and pain. ©1979 by Anne O'Brien Rice (P)1991 by Random House, Inc.
Would you try another book from Anne Rice and/or Courtney B. Vance? What was one of the most memorable moments of The Feast of All Saints? It was way too short to really tell the story! I need the read the unabridged version of this story. With the way it is chopped up now it doesn't make much sense. Please get the unabridged version. Courtney B. Vance can still read it, but at least give him a chance to do justice to the story. Yes indeed! I have read the book and seen the mini series. It was fantastic both times. This version is just too short to do the story justice. I would love to listen to a full version of the reading of this book. Again, I give this work one star because it is not possible to do this book any justice in a 3 hour time period. It was my fault for not checking to see if it was abridged or unabridged, however, take the time to read the whole book instead of listening to this farce of a book. I listened to this book because my book club selected it. I was intrigued with the characters in the story and the period of history it explores and the performance was very good. Typically, I purchase unabridged book versions but that was not available. Since it was only three hours long, I wonder what all we missed. I feel like I bought the cliff notes and I don't know how I would feel about reading the entire book. Would it be too slow and boring or would it give us more insight into the lives and struggles of our characters? I LOVE the book, but the audiobook is so abridged that they lost the narrative. Put a stop to abridged books! I don't get the reason why so many audible books are cropped. If you enjoy the story, you like it to keep going, not to finish asap. This is was the saddest read/listen of my life. I am a HUGE Anne Rice fan. And yet, I feel like The Feast of all Saints fell so far short. Courtney B. Vance (the narrator) was amazing. His voice was soothing and kind. Welcoming. He made everything around you stop as you listened to what he was attempting to convey. But the story fell short for me. Unlike Vittorio the Vampire or Interview with a Vampire, The Feast of all Saints was a longwinded diatribe of fear and explanations. While the book is clearly from the point of a young man, it felt more like the inner thoughts of a teenage girl wondering if the boy likes her or not. The book fell very short for me. It was not to par with Anne Rice’s other Vampire works. Maybe someone else will love it? This is a great book, and I cannot understand how Courtney made the book so dry. Then there are only four chapters and those are not complete chapters. I wish I paid more attention to the description before I wasted a credit. I normally love the performances, but today I am disappointed! I gave the story five stars because I know the story is great! it was somewhat a struggle following sometimes but I enjoyed the story. I would enjoy more of this authors works. 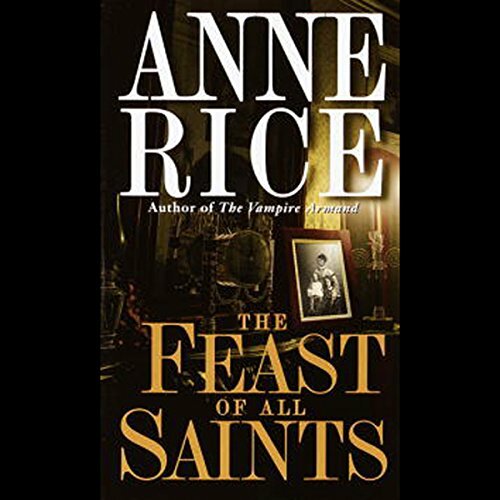 This incomparable book by Anne Rice is only somewhat captured here -- I listened to refresh my recollection of it, one of my favorite books. The performance is extraordinary, but so much of the richness of this tale is missing, I would hesitate to recommend this to anyone who hasn't read the entire book first -- and then, only to bring back to memory important parts of the unabridged masterpiece. What made the experience of listening to The Feast of All Saints the most enjoyable? Have you listened to any of Courtney B. Vance’s other performances before? How does this one compare? If you could rename The Feast of All Saints, what would you call it? The only disappointment is it was only available in abridged. A story this rich and sensuous can only be UNabridged. It was a tease.